Get paid to hang out with charming baby in West Vancouver! Want to be hired by Bruce? **update: thank you to all who applied, the position has been filled. All the best in your search for a family! 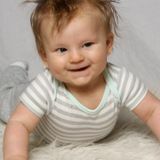 Hi, we are a couple looking for a loving full-time nanny for our four month old boy. He is a happy little guy just working on crawling, but by September at six months old he will surely be zipping around and exploring everything. We live in Ambleside West Vancouver, within walking distance of several bus stops, the community centre, and some parks. There are lots of activities for babies in our community, including story time at the library, a drop in playtime at the rec centre or just up the hill at Chartwell, and music classes just beside the rec centre. We are looking for someone who likes to get out and about on adventures with baby! We also need help with light housecleaning, meal preparation help, and occasional dog walking. Our top care provider would are First Aid certified however it is not necessary to work with us. Ideally we are looking for someone whose first language is Spanish, but this is also not a requirement for the job. You can reach out via this website and we will follow up. Seeking nanny to help with two young children, meal prep and light housekeeping. Langley part time Nanny Job (mother helper) to join our family for infant twins & toddler. Someone fun and energetic!